eCite - Pre-trial defence disclosure in South Australian criminal proceedings: time for change? Pre-trial defence disclosure in South Australian criminal proceedings: time for change? The issue of defence disclosure in criminal proceedings has come under renewed focus as a result of the recent Criminal Procedure Amendment (Mandatory Pre-Trial Defence Disclosure) Act 2013 (NSW) which imposes comprehensive duties similar to those that exist in Victoria and England. 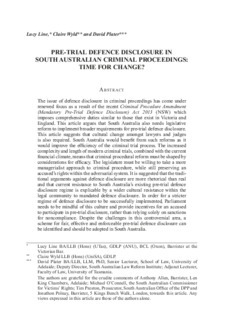 This article argues that South Australia also needs legislative reform to implement broader requirements for pre-trial defence disclosure. This article suggests that cultural change amongst lawyers and judges is also required. South Australia would benefit from such reforms as it would improve the efficiency of the criminal trial process. The increased complexity and length of modern criminal trials, combined with the current financial climate, means that criminal procedural reform must be shaped by considerations for efficacy. The legislature must be willing to take a more managerialist approach to criminal procedure, while still preserving an accused’s rights within the adversarial system. It is suggested that the traditional arguments against defence disclosure are more rhetorical than real and that current resistance to South Australia’s existing pre-trial defence disclosure regime is explicable by a wider cultural resistance within the legal community to mandated defence disclosure. In order for a stricter regime of defence disclosure to be successfully implemented, Parliament needs to be mindful of this culture and provide incentives for an accused to participate in pre-trial disclosure, rather than relying solely on sanctions for noncompliance. Despite the challenges in this controversial area, a scheme for fair, effective and enforceable pre-trial defence disclosure can be identified and should be adopted in South Australia.